Spyware can infect a computer without anyone knowing. It can monitor web surfing habits, change computer configurations or worse – steal personal information, like passwords and banking information. Unprotected computers can place personal privacy and identity at risk. 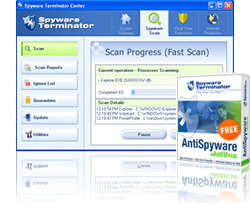 Use effective antispyware Spyware Terminator for comprehensive detection, complete removal and 24/7 prevention of spyware threats. Millions of users worldwide rely on Spyware Terminator, winner of many awards and high ratings from industry experts and users. Its free comprehensive protection is comparable to competitors’ paid versions!